Anyone have the LEM 30LB motorized stuffer? | Smoking Meat Forums - The Best Barbecue Discussion Forum On Earth! Anyone have the LEM 30LB motorized stuffer? Discussion in 'Sausage' started by InThePittBBQ, Nov 7, 2018. 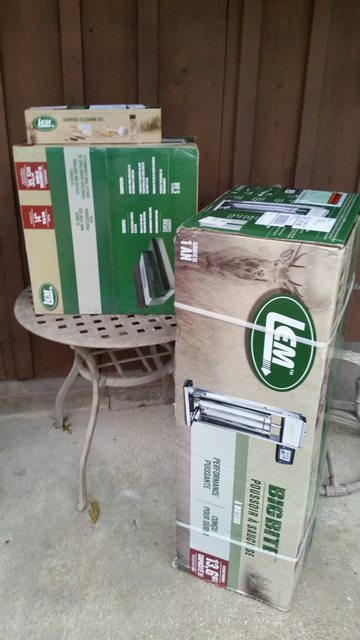 I rolled the dice over the weekend and ordered one when LEM had the sale on Big Bite products, #22 grinder showed up yesterday and the stuffer and vac sealer came today. This thing is HUGE! There's a fat guy's high backed lawn chair hiding behind the box, (not knocking fat guys, it's my chair lol). I am tearing out the old prep area and replacing it all with new stainless counters and prep tables but this may need it's own production table just to run it if what comes out of the box does the size of the packaging justice. No, I do not have one, but I want one really bad!!! I do large batches f sausage, 50~200lbs. at a time. I need a 30# motorized stuffer. Yes you do, I'm making 80 pound's of Polish 2-3 times a week and this is going to save me some time and a sore back I hope. Electric foot control is very nice though. Congrats on your shopping spree ! We ran an 18lb batch of snack sticks this morning with it just to see how it performs, didn't so much as change cadence at all not a bit of hesitation. If you compared LEM's 30lb electric stuffer side by side to what Cabela's offered you'd toss rocks at it and drop it in the recycle bin. Did 82 pounds of Polish afterwards using Syracuse casings on the speed load strips, after the first few pounds I dialed up the speed and we ran through all of that in under 20 minutes. No additional water needed aside from what's already in the recipe I use at about 3/4 cup per 5 pounds. All my helper did was just swap meat totes when full and I did the rest. ~It was worth every penny, been using their grinders for some time now and should have done this much sooner. The 1000 model vac sealer I got is awesome to, runs circles around the cheaper units I used in the past. I think the old cabelas stuff was made by LEM, probably a lot better now days. Do have LEM grinder, that thing is a beast. Glad to hear thing works good, so when this dinasour goes down on me. Come on over and try it out! You need this in your life lol, it's amazing build quality. I'm not one to fanboy anything, you do your research and get what you pay for but this gear from LEM is so nice you don't miss the money the minute you pull it out of the box. I dumped all my old gear on Craigslist yesterday and it carried itself away for a couple bucks, I won't miss any of it. I got it in September and I absolutely love it. Works like a charm, the adjustable speeds are great and foot pedal allows you two hands to guide the casing off the tube and stuff to the fullness you want. I love that you can just back it up. Sure it takes a few minutes but it gives you time to clean some stuff, get your next batch out of the fridge, etc. It is definitely an investment but if you are making large batches even a few times a year, it is worth it. Ill be making some jalapeno bacon cheddar smoked sausage soon so I'll get to use it. For small batches, I still just use my older LEM hand crank stuffer. One thing to consider before buying one of these is the vertical clearance it needs, I never looked to see if there is a spec from LEM on it but this takes up 53" of vertical clearance from counter top to the highest point of travel on the main gear rod. That would preclude it being used on most kitchen countertops with any soffit overhead for cabinets etc. My permanent spot is getting a remodel right now but it fit on a cart I had on hand for temporary use but I have to change the overhead cabinets we had planned on using in the area above it due to it's height. My baby looks absolutely identical but a bit smaller - mine is #20 stuffier. Love it! 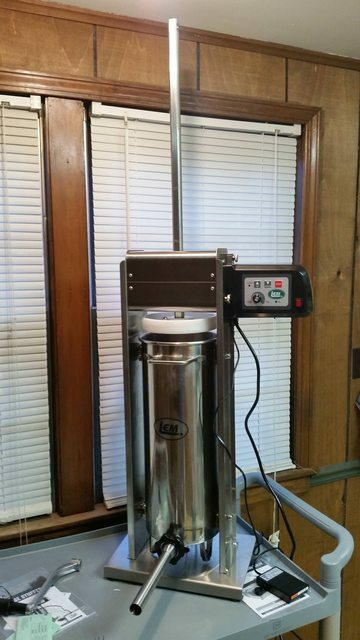 I've had my eye on this for some time, we got big enough catering smoked corn and sausage roasts that I started making Kielbasa in house and have been using an LEM grinder to grind and stuff. The grind time is next to nothing, stuffing is a whole different matter after the first 50 pounds that auger and assembly get's warm and the fat in the meat starts to stick to everything. It was a $75.00 difference between the 20 and 30 pound machines at the sale price, we stuffed over 160 pounds of Polish today and I'm really glad I got the bigger unit. On the last fill we had about 7 pounds of sausage left still in the meat tote that wouldn't fit and after running it down a bit I dialed up the speed all the way and hit the up button and there's just enough room when the pusher is all the way up above the cylinder to add more meat and that took care of the rest of it. The cylinder on my 30lb measures 8" wide by 19 1/2" high, hopefully @pushok2018 can check his 20lb and see what the size difference is. Thanks! The pictures from LEM do make the 20 look like it's a wider barrel but I came across some specs from LEM today that confirm they are the same. Looks like the ID's of the cylinders are the same at 7 3/8" with the 20 being 13" tall with a total volume of 2.407 gallons and the 30 lb unit's cylinder is 19 1/2" tall by 7 3/8" ID diameter for a total volume of 3.611 gallons. I wonder why they didn't just make a 25 pound machine and call it a day like sausage maker does? You need just a little more than 20 pounds capacity to cover the volume of a meat tote that's full to the lid in two cycles and a 25 pound machine would cover that easily. Put ours to use yesterday man this thing is slick! Packed alot of venison in bags and did 30lbs of polish sausage worked great! !